Like the original set of 'What Are They Thinking?' Colorcards, this collection of cards is designed to encourage users to focus on the thoughts and feelings they and other people experience when confronted with a situation. Each card includes a 'thought bubble' to facilitate consideration of both what that individual is thinking and also the user's personal response. There are discussions about the appropriateness of the situation and of the best way to deal with it will all help to develop: Thinking skills; Understanding relationships; Problem solving, and, Social and emotional skills. The cards cover a diverse range of circumstances, including: difficult or dangerous situations; team work; tests and achievement. Like the original set of What Are They Thinking? 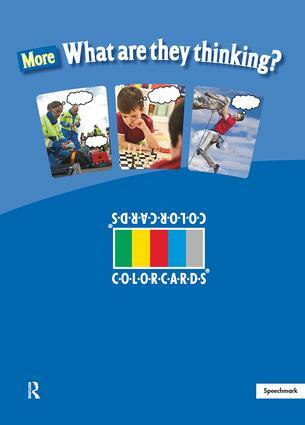 Colorcards this collection of cards is designed to encourage users to focus on the thoughts and feelings they and other people experience when confronted with a situation.